Walk (or dive off a building and stab someone) like an Egyptian. There are a few things in life you can count on; summer will lead into fall, one of your friends will keep insisting that Babylon 5 is actually worth watching, and Ubisoft will spend a billion dollars making sure you are doing generic open world missions, no matter how much you don’t want to. This year’s helping of the Ubisoft open world game is the same as it ever was while also being just fresh enough and so impossibly extravagant that it has managed to change the overall perception of this reviewer who was incredibly hostile to the idea of playing the game in the first place. I played and mostly enjoyed the first 2 Assassin’s Creed games when they released. I passed on the subsequent entries until Black Flag came along and allowed me to escape secret societies and earthy-toned city streets for a chance to live life like a pirate. My adoration for Black Flag led to my strong anticipation for Assassin’s Creed: Unity, but it only took about 2 hours of troubleshooting technical issues in Paris before I uninstalled. I couldn't be bothered to care about Syndicate and felt similarly when I saw the debut of this year’s entry during E3. When I found out that I would be reviewing the new Assassin’s Creed game, I was excited. Excited like they way I’m excited by the thought of getting a colonoscopy. 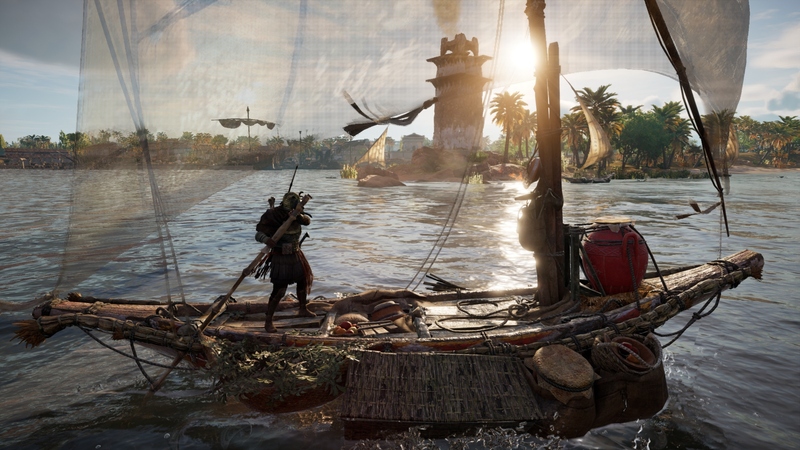 I could rattle off details about how the game is structured or take the time time to explain each of the newest features of Assassin’s Creed: Origins (ACO for short), but most folks already know all of this or know which wiki to find it from. What is the hook this year? Egypt. 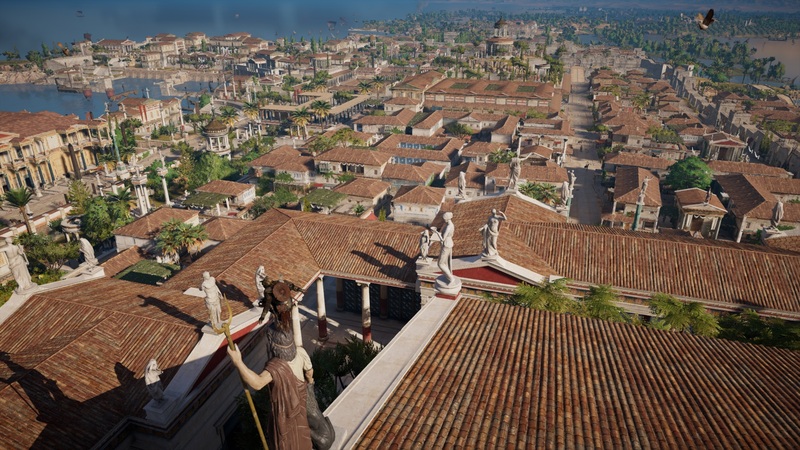 It’s somewhere in Africa and in ACO, it appears the the Greeks are running Bordertown. The stuff you’d expect is present and accounted for, like the pyramids at Giza or scattered hieroglyphics. Being set around 50 years prior to the birth of Christ, all those famous symbols of ancient Egypt are already worn down or nearing burial from the sands of time. The land is ruled under the hand of Ptolemy XIII and loosely goes into all his business with his sister Cleopatra and their involvement with Julius Caesar and Pompey the Great. 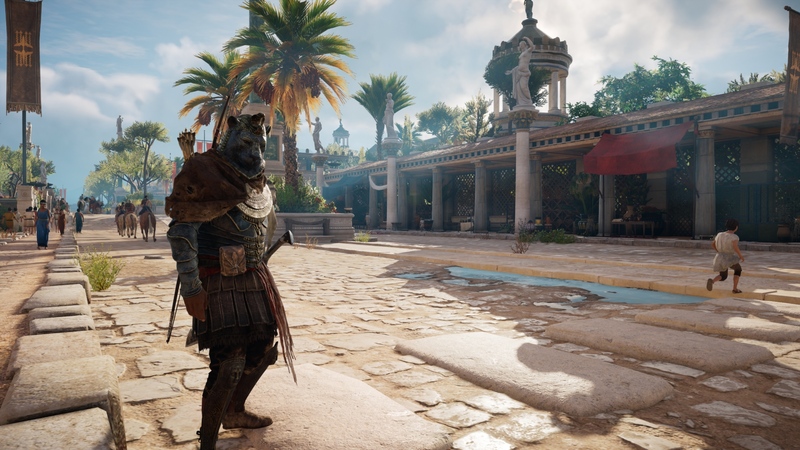 Everything plays out through the perspective of a fellow named Bayek, who is forced into the life of slicing fools and climbing things as the result of a tragic family event. Admittedly, I don’t remember any of the characters from previous Assassin’s Creed games other than that present-day guy who looked like Frankie Carbone with a shaved head, but Bayek seems like the best of the bunch. I found it rather easy to buy into his plight and did not feel the urge to skip past his cutscenes. 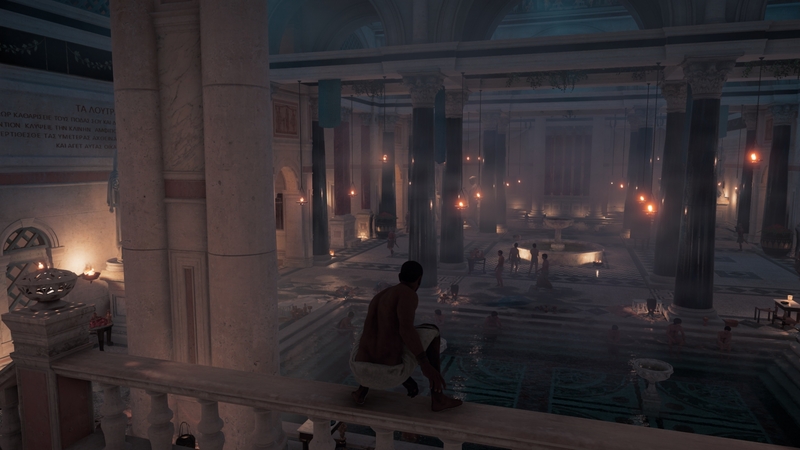 Honestly, it took close to 4 hours before I stopped loathing my time spent with ACO and started legitimately enjoying myself. The game is rotten with cliche open world busy work. You have to climb towers that reveal more busy work and serve to make the already cluttered HUD become even more messy. You have some sort of spirit eagle that is intended to help you overcome the adversity, but in practice, the bird is simply a predator drone that a multicultural team of various faiths and beliefs hotglued feathers to. Every encounter puts a gold blip on your HUD and the moment you get near it, the game pesters you to call in the eagle drone, which shows you everything and 3D highlights any possible enemy or surprise. This takes much of the discovery out of the experience, but without it, the game would likely take 300 years to complete. Combat is improved over what was seen in Assassin’s Creed Unity, but that doesn’t really mean much. It is less reliant on Arkham Asylum-style counters and warping animations, which is nice, but it still feels lacking. Default button assignments on the gamepad elicit comparison to Dark Souls, with a light attack on the right bumper, heavy attack on the right trigger, and shield on the left bumper. Parrying is done with a face button rather than the left trigger, so it can’t be labeled a straight copy. Unfortunately, in practice, the combat is nowhere near as smooth or rewarding as what you get from a Souls game. The only time I really felt engaged with the system was during fights with some top-tier bounty hunters known as Phylakes. The game world in ACO is enormous. Featuring a map that is much more spread out than in previous entries, the game is less about scaling townhouses and cathedrals and more about cameling yourself to each objective. For me, this is a welcome change. Climbing buildings and towers is dope as hell, but not after you do it 200 times. ACO ushers you from location to location at a breakneck pace and you never feel like you are navigating the same building over and over. In my opinion, Egypt is the star of the show and the only real reason to hop into game if you aren’t a series diehard that was going to buy it anyway. Having not personally spent time in the setting since Sierra’s excellent Egyptian RTS games of the late 90s, I found stabbing people along the run of the Nile to be a real treat. It doesn’t hurt that the game is absolutely gorgeous. The models, textures, and shaders work together to bring the world to life. Lighting is as good as anything I’ve seen in videogames and is as good as or better than what was seen in Uncharted 4. Dawn and dusk are simply breathtaking. Everything looks so good that it makes the jerky animations stand out like a sore thumb, ACO is not the only game that suffers this issue now that we live in a world where every AAA game looks really good. I feel it should be repeated - ACO looks REALLY good. This review is based on the PC Uplay release. The game key was provided by the publisher. Assassin's Creed: Origins is available for Windows, Xbox One, and PS4 on October 27, for $59.99. The game is rated Mature. So this is where we are now I guess. Game companies no longer make games, they make microtransaction engines ala Shadows of War and AssOrgy. Babylon 5 is totally worth watching. Nobody cares about your stupid space shows. you wish it cost $80? I would not mind a higher upfront cost for expensive to produce games to prevent the progression from being balanced to push microtransactions. Most of the video is about taxes, but budgeting and other concerns also pop up. is this worth getting if im interested to experience ancient egypt. You're gonna have to stab someone to unlock all the cities. Memphis and Alexandria are amazing.